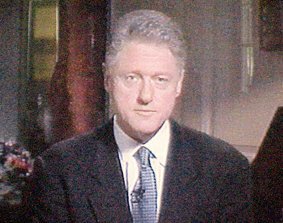 Bill Clinton speech "I Misled People"
This speech was delivered by President Bill Clinton on Monday evening, August 17, 1998, at the end of an extraordinary day in the history of the presidency. Earlier in the day, Clinton had become the first sitting President to give testimony before a grand jury in which he, the President, was the focus of the grand jury investigation. It was the latest in a long chain of legal entanglements resulting from a sweeping investigation of the President by Independent Counsel Ken Starr as well as a private lawsuit concerning alleged sexual harassment committed by Clinton before he became President. In this speech, Clinton publicly admitted for the first time he had a relationship with former White House intern Monica Lewinsky. The admission occurred several months after a much publicized dramatic denial by the President. That denial had been staunchly defended by First Lady Hillary Rodham Clinton, White House staffers, and various friends and supporters of the President. President Clinton on Television 8/17/98.